Rural Revival: Orange you glad? The dog days of summer may be running hot and heavy, and while everything else withers and fades like a distant memory, daylilies seem doggedly determined that the show must go on. Here are a few interesting facts about the daylily. The familiar orange variety that seems to pop up along many a country road throughout North America is not a native wildflower at all. All varieties including this one can trace their ancestry back to Asia. Parts of the plant have been eaten in Asia for hundreds of years. Interesting...maybe I should plan on hosting a daylily roast for friends and family? They were spread west across North America by settlers who brought plants with them as they headed west, which is either a testament to the determination of those braving the wild frontier or how hardy the daylily bulb is. There is a variety of daylily that is nocturnal daylily; I guess you could call it a nightlily. 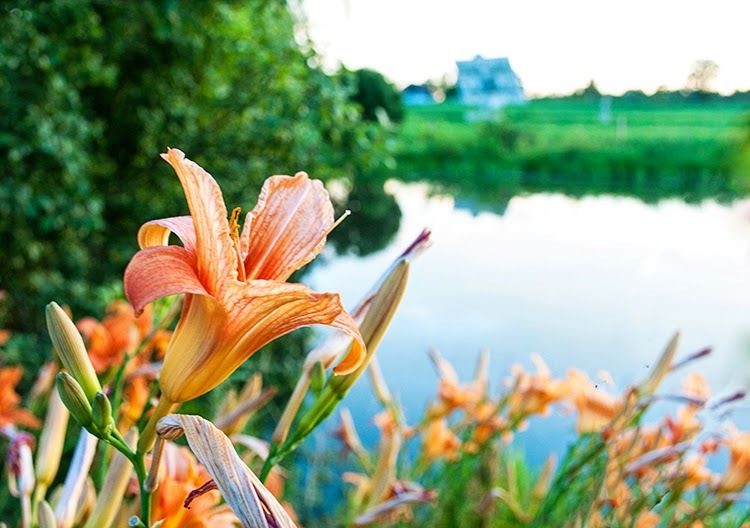 The scientific name of the daylily is Hemerocallis which is Greek for beautiful for a day. Orange you glad you learned all that? Okay, okay, orange you glad it's Friday? I've even seen friends in the UK with these day lilies. We have them everywhere this year! That was a lot better than a banana (ornja glad?). I did learn about the orange day lilies. Ours aren't orange down here in Texas. I am very happy I learned all of that. Happy orange, yellow, purple and peach Day Lily Days! Fun post. You see the orange day lilies everywhere. Amazing. Lilies are a plenty where I live. What I didn't know was they are also eaten. Those are some interesting facts you share. If you could kindly link back to the meme. Thanks for joining and I hope to see you again next weekend. I've been enjoying all across blognation, but have never planted any myself. They are gorgeous! i remember tiger lilies from wisconsin. don't see too many lilies here in texas. i think we're just too hot and dry. Lovely orange lily photo! They are cheerful blooms. I love these beautiful 'wild' orange lilies and years ago before it was illegal to do so, gathered some from roadside to plant in my own yard. My only wish that they bloomed more often, but I deeply enjoy them especially when paired with purple flowers in the foreground. Lovely! My former grandmother-in-law, used to eat the blooms. She encouraged me to taste them and they aren't bad. She both served them stuffed (like a squash blossom) and served them raw over her salads. The photo is beautiful!! The orange with the blue background is so lovely. I've seen day lilies around here, but mostly in botanical gardens and such. They're beautiful.